REVIEW: Trinity #20 - Do You Even Comic Book? 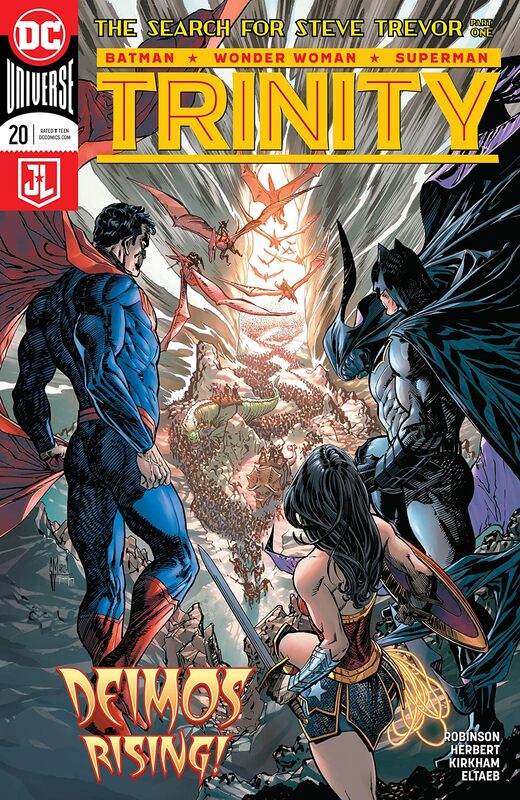 The new arc of Trinity continues right where the previous ended, as Batman, Superman, and Wonder Woman are out to search for Steve Trevor. So far we don’t know what kind of mission Trevor was on, but all that matters right now is that Deimos has captured him. I would have to say that the most enjoyable parts of this issue is the art and panel work. We are given a lot of action scenes that are spread out in three different locations where our heroes are. I always like it when I notice a little bit more details in characters when they’re drawn. The colors never look off and the inking done for the shadows doesn’t go overboard, even in the night scene panels. As far as the story goes in this, I don’t feel like this is a story that’s really needed to be told. I’m not really sure when this issue is suppose to take place along with what’s going on in the current Wonder Woman comic, but the story here right now just seems a bit too generic. We’re seeing the trinity work together for something but this start does not come off nearly as strong as all the previous arcs. I think the investment juts feels small because all we have to go off of right now is the team trying to rescue Trevor and outside of that, we’re just not sure what all else is going on. A majority of dialogue are just a few fun quips and communicating to assure everything is going well with each other as they all fend off their attackers. When looking back to how this series started off to where it is now. I think it’s very clear that the Trinity needs to at the very least go on a break. I haven’t felt that we’ve gotten a very focused story on the three in this run in a good few months now and with the way this arc is starting, it doesn’t seem to be going uphill either. Even though the art is great to look at with some fun moments of the three using their abilities to knock down many robots from small ones to a giant one. The issue feels empty with not enough weight carrying it forward to make you feel you’re about to read a grand epic with three of the greatest superheroes ever created.